* If you haven't already linked your Infusionsoft application to Parsey, first follow this article to do so. If creating a link with a new app, add a label as well as the Infusionsoft application name and API Key. 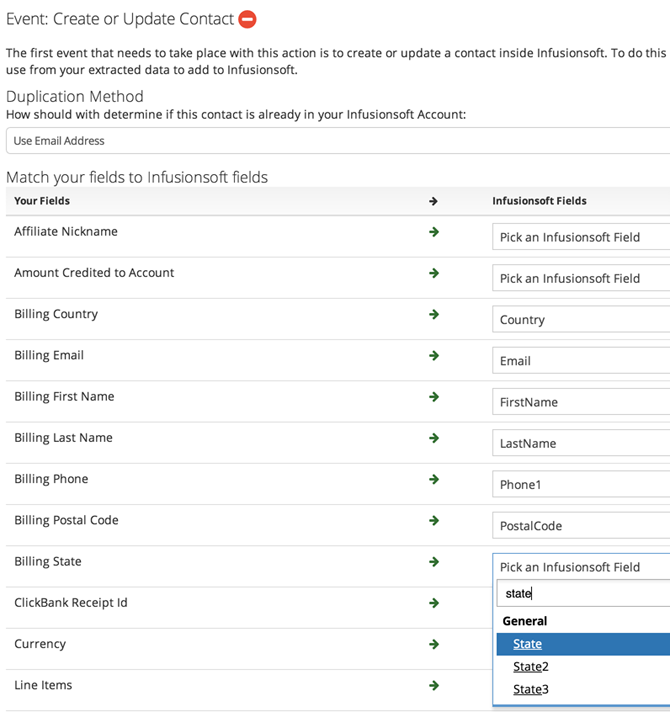 Configure any Custom Values or Magic Fields you'd like (not common for Creating a contact from a ClickBank purchase). Click 'Save Contact Settings' when finished. 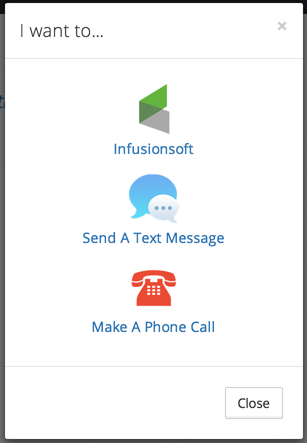 If you'd like to add the order information to Infusionsoft, select 'Yes' from the drop-down menu. Give the order a title to be used inside Infusionsoft. 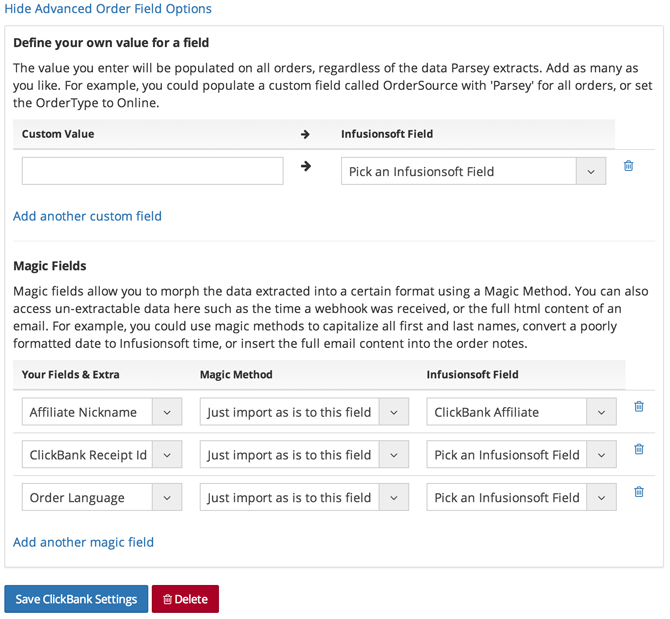 Here you can hard code any custom values you wish or map any other data points from ClickBank's notification to Infusionsoft Order Record's standard and/or custom fields. * The most common thing to map is the 'Affiliate Nickname'. 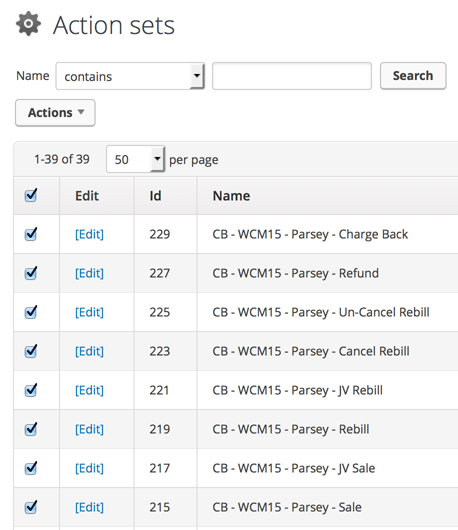 This will provide additional insights to your reporting as you'll have the ability to sort/filter orders by affiliate. 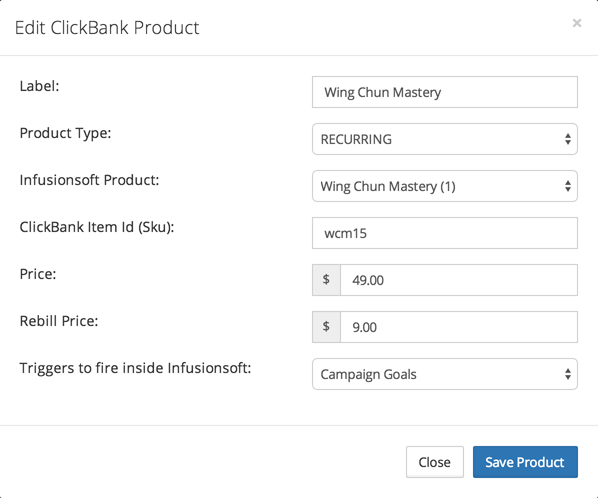 * If you have not already created a unique product in Infusionsoft for each product in ClickBank, follow this article to do so now. * If you want to edit the label after you've saved the product, you can do so by clicking on the gear icon again and then click 'Edit Product'. * You'll now see the following depending on whether its a subscription or one time purchase. 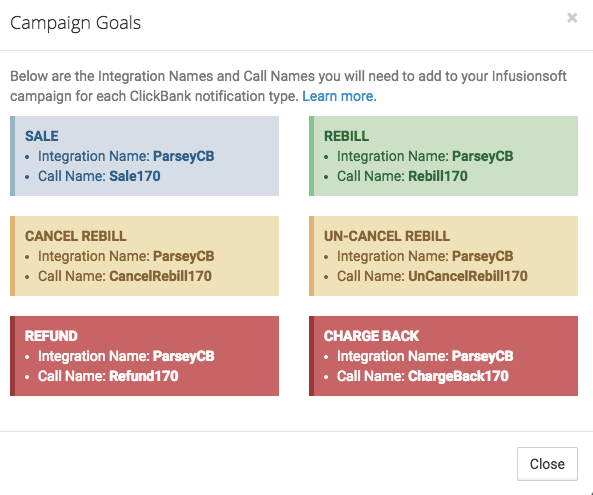 Use the Integration Names and Call Names provided in the modal or lightbox in your Infusionsoft Campaign. If configuring for a Recurring product, you will need 4 Goals and 4 Sequences. If configuring for a Standard product (one time purchase), you will only need 3 goals and 3 sequences. 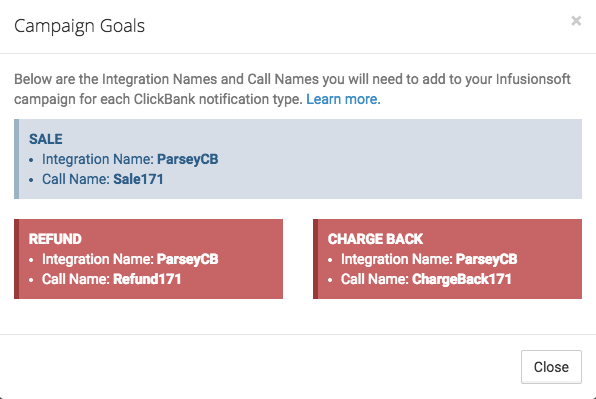 Next, double click the goal icon to input the Integration Name and Call Name provided by Parsey. * For more info on Infusionsoft Campaigns, read this article. 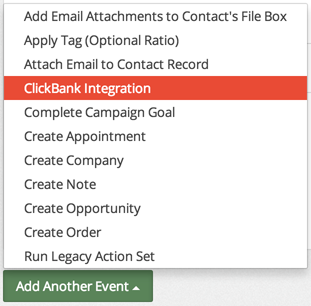 With in Infusionsoft, create an Action Set for each possible notification type from ClickBank. 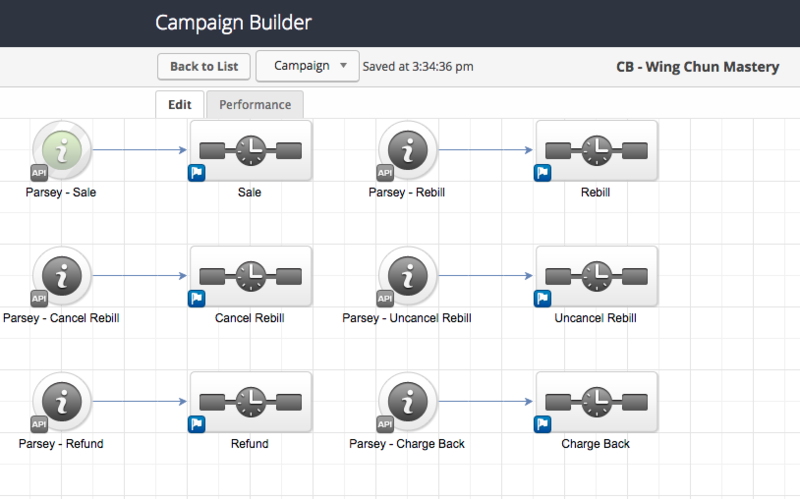 If configuring for a Recurring product, you will need 8 Action Sets. 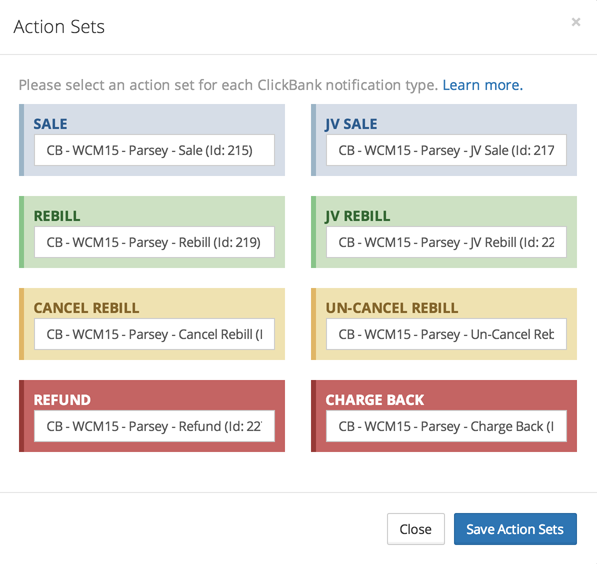 If configuring for a Standard product (one time purchase), you will only need 4 Action Sets. * You'll now see the following modal or lightbox. Begin typing the name of each Action Set in its corresponding input field. Select the correct Action Set for each notification type. Scroll to the top of the page and click the green 'Back to Actions' button. 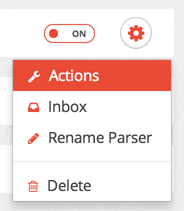 Inside Parsey, click on 'Webhook Parsers' either from the sidebar or the breadcrumb navigation at the top of the screen. 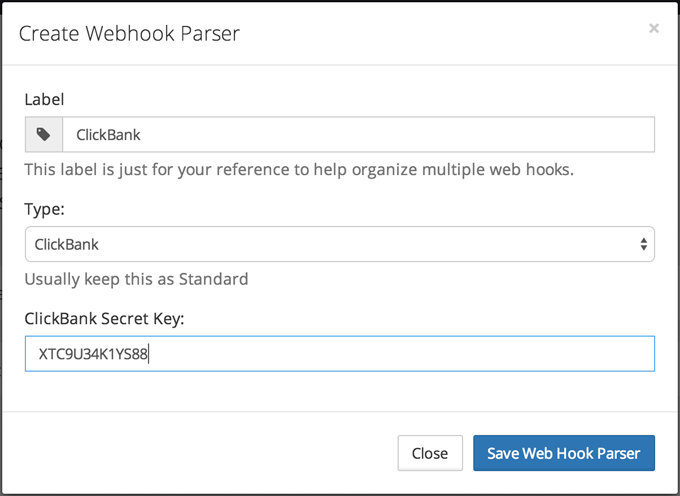 On your ClickBank Webhook Parser, click the Copy icon. Next, log into your ClickBank Account.